Thank you for your recent series “Selling Senior Care: Kept in the Dark.” It’s true, when consumers search for senior care housing, it’s a daunting task. Finding information for making informed decisions is time-consuming and stressful. Consumers search the internet and weed through marketing hype. It’s hoped they’re looking up facility complaint history. But consumers don’t know what they don’t know. The better alternative is calling a senior referral agency. Consumers seeking senior housing can rely on a senior referral agency as a “one stop” resource. There are several qualified agencies in Oregon. They specialize in helping seniors and families find exceptional care in their area. The best place for finding an expert referral agent is through the Oregon Senior Referral Agency Association (OSRAA). OSRAA is a member organization. The organization developed a Code of Ethics and Best Practice Standards. An older adult’s well-being depends on prudent decisions. OSRAA members arm them with the information they need. Referral agents make referrals to senior housing based on a comprehensive intake. Agents determine care needs, social preferences, goals and budget. A list of communities matching a senior’s criteria is compiled. Personal help in touring communities is part of an agency’s service. As is a follow up call after a senior’s move. Families receive education on other resources like Veteran’s benefits and government programs. Like you, OSRAA members support better access to public disclosure files. But families often don’t take time to search it out. Relying on a referral agent provides access to information. Families can make informed decisions. Working with a referral agent helps ensure safer transitions for our vulnerable seniors. It’s critical that families get accurate information from a referral agency. That’s why OSRAA advocates for stronger regulation of referral agencies in Oregon. OSRAA and industry partners have teamed with state legislators sponsoring HB 2661. This bill would require certification, verification of training and background checks on all referral agents. For more information about OSRAA and HB 2661, go to www.osraa.com. Our seniors deserve quality service and care. Families need reassurance about the choices they’re making. They need to know where to turn for help. Please consider running additional articles about senior referral agencies, OSRAA and HB 2661. Local referral agencies do business quite differently than online lead generators. Read one Portland woman’s story about her experience and the differences between help via the internet vs a local, caring and listening agency. Mary called me as her husband needed help. Mary’s story was sad, her husband had Alzheimer’s and needed a lot of help. Her son had just passed and she just had surgery. Mary didn’t have time to grieve for her son or recover from her surgery because she was the main caregiver for her husband. Getting trapped on the internet. Mary contacted an internet lead generator that sent her a couple of names of memory care facilities in her community. The marketing people from those facilities immediately started calling Mary asking her to come for a tour, come for lunch, come soon as they only had one room available and others were interested—she should come right away or the room would be rented by somebody else. She was getting a lot of pressure to tour right away, so Mary, on her own, visited the places the internet lead generator sent her. She hated them both so decided to keep her husband at home putting her own recovery and grieving on hold. Changing course with the help of a local business. A friend of Mary’s let her know there are local referral agencies that can help too, so she contacted me. I met with Mary, listened to her talk about her husband and what care he needed and her need for time to grieve for the death of her son and recover from her surgery. I asked about her finances and what they could afford long term to ensure they weren’t leaving her without money to live on. I introduced her to an elder law attorney so she could get a Power of Attorney for her husband as moving into a memory care community requires POAs. I asked what was important to her and to him. I listened. Success- finding the right fit. I took Mary to tour a memory care community less than a mile from her house. The community doesn’t contract with the internet lead generators so they didn’t tell her about that option. The community is tucked back into a neighborhood so she didn’t even know it existed. She loved the community, clicked with the staff and knew right away it was the right place for her husband. She was able to move him in as soon as the Power of Attorney was completed. She was then able to focus on her own care and become a wife again rather than a caregiver. Local Referral Agencies = Hands-on. Local referral agencies do more than send clients names of options. They listen to what their clients need. They ask about finances and offer ideas on how to pay for retirement living. They tour with their clients; they ask questions clients may not think to ask. They visit every community before touring so they’re familiar with the community’s strengths and weaknesses. They check county records to see if there are substantiated complaints or bad survey results that may be red flags. They hold their clients’ hand through the process and are advocates for the clients. Local referral agencies know that the senior’s needs come first and do everything they can to ensure the ultimate decision is the right fit. One of my close loved ones has always loved having cats. She has limited mobility and isn’t able to provide the care needed to have one nor is her husband who has his hands full taking care of her. Studies show pet therapy helps seniors better cope with health problems, such as heart disease, cancer and mental health disorders. Not being able to provide the care needed for a pet has eliminated her ability of having a pet from which she would truly benefit and so dearly love. Therapy Cats from Hasbro. Photo courtesy of Hasbro. 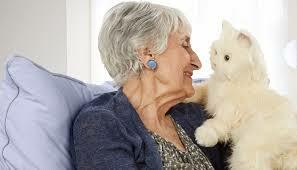 She was given a therapy cat, it’s a very lifelike ‘robot’ cat that has realistic fur. The cat purrs and meows, it rolls over so you can pet its stomach, and its eyes open and close. My loved one quickly learned if she pets the cat’s left cheek it will nuzzle its head in her hand, if she pets the cat’s back it will purr. The more she petted it the more relaxed the cat got then it goes to sleep. The best news for her is the cat doesn’t need care (other than occasional fresh batteries) or feeding and there are no vet bills. It’s a perfect pet! The benefits of pets are numerous. They making owners happier, they lessen depression, decrease loneliness and isolation by giving pet owners a companion. They also reduce boredom and lessen anxiety because of their calming effects. The Companion Pet meets the mark in providing just what my loved one needs without the care an unstuffed pet requires.